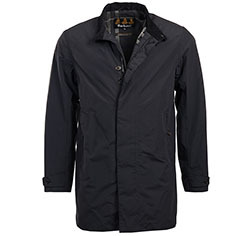 Barbour Golspie waterproof jacket is from the New Black Tartan collection. A smart, simple, semi-fitted, full waterproof jacket with adjustable button cuffs, concealed front placket and Barbour's black tartan inner. 100% waterproof & breathable polyamide. Two welt pockets with button fastening. Barbour logo on welt pocket. Available in black with black tartan lining.